Home Software Testing Top 10 reasons why software testing is important ? As mentioned the software quality is very important in this competitive world. Before product reaches to real world, it should be tested properly by experts. Sometimes a minor bug result big loss as well as affect the reputation of company. Therefore, in agile software testers are known as quality assurance team. 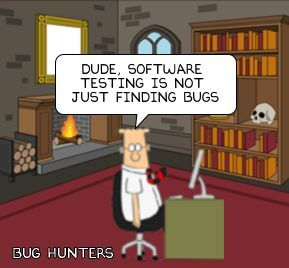 Software testing helps developers to find the bugs and scenarios to reproduce the bug. So, it becomes easy for developer to fix it quickly. Also, software testers can work parallel to developing so all over process becomes fast. Developers are not much used to with negative test cases. Some developers don’t like to crash down the application he/she made. Some time because of shot time and confidence on his code they don’t test application properly. So, separate software testing team is very important. While testing, Testers test application in different platforms and different devices. So, before product reaches to customer it is easy to find out performance of application against different devices and platforms. So, if required it is easy to improve performance against various factors. If you directly deliver the untested product. While using customer kips on finding bugs and design issues. Each time he must report to the company and need to give enough information about the issue (like logs, screenshots etc). And you may have ended up losing the customer. As discussed in customer satisfaction, if product is tested in different platforms and devices with all possible combinations, there are fever chances that your customer (or user) will not get obvious bugs and design issues. So, there will be low maintenance. Some Applications or software are for direct users, Like Shopping apps, Apps for cabs, Apps for banking or trading etc. If there is small bug in such app, it may cause huge loss to the company. So, they must have proper expert software testing team. Developers alone could not test application on various devices and platform and fix the issues. So, it’s good idea that you have separate team who tests application in all possible type devices and platforms. So, it will end up lesser bugs after elevation. Sometime developers need live logs to fix the issue. When customer/user files any issue need to reproduce it to fix it. For that a person needs to try various test cases and find proper test case to reproduce it, which is done by software tester. To certify the quality of the product. Yes, someone must conform product before it goes live that product is properly tested, it is working as per design. Software testers assures the quality of product. Software testing is not just finding bugs while developing face of product, it’s much more. Software testers assure the quality of product, saves company from big loss, saves the lives (what if hospital software is buggy!). They make developers life easy by testing products across the platforms and devices. They help developer to resolve issue with proper logs, screen shots, test cases and all possible way. So, all over production goes fast which is necessary in this competitive world. At the end quality of product also matters. So, software testing is as important as development.